Make your bingo dreams comes true at one of the top online bingo sites for UK bingo players. Choose Dream Bingo UK and dream big today! Dream Bingo UK has 90 ball bingo and 75 ball online bingo games that are fun to play packed with vibrant colorful bingo rooms. You can take part in several options of games with the Progressive Jackpot (PJP) where can win in excess of £1,500 regularly and Promotion games. Winners can get the chance to win extra bonus money. There is a vast array of slot games to play also, with 30 to choose from. Get your friends involved and you could be a winner! With all of the great online bingo games there is something for everyone at DreamBingo UK – so what are you waiting for? Visit today for more information on how to win and join in the fun at Dream Bingo UK and grab your 300% first deposit bonus for free. This site has made an upgrade and is now available for Mobile devices! 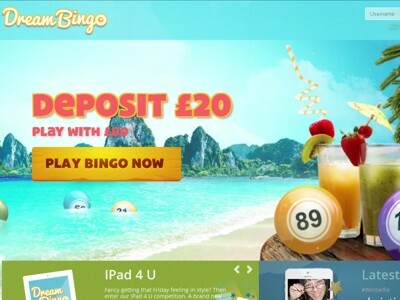 Bingo players can enjoy four different bingo rooms as well as 19 HD Casino games, while playing on any iOS device (iPhone, iPad or iPod Touch), with all iOS traffic to DreamBingo redirected to the Mobile products. These new mobile games give players a wide range of safe and secure banking options, with 24/7 support available via phone and email. Next year will see the addition of Live Chat and Pre-Buying Tickets, with Android support also coming at the start of 2013. For now these mobile products, which are set to appear in the UK App Store very soon, are only available in English – with more languages and features expected in the coming months so make sure you stay tuned! If you enjoy playing slots games than try your luck here. There are tons of awesome games including; Immortal Romance, The Osbournes, The Mega Moolah, Karate Pig and many more. Dream Bingo UK is no longer approved by bingoguy. If you are looking for more great sites to play UK bingo than check out our Top UK Bingo Sites. All new bingo players start off with a 300% bonus which means when you deposit £20 you can play with £80 at DreamBingo.com. When you play here every day is bingo day! So get playing and you could be next Dream Bingo UK Bingo Winner.